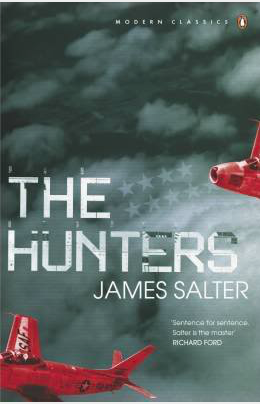 The Hunters was James Salter’s first novel. It is based on his own experience as a fighter pilot during the war in Korea. The Hunters tells the story of Cleve Connell, an excellent, seasoned pilot who is sent to Korea. Cleve is anxious to get there. He wants to prove himself and become an ace, a fighter pilot who has shot down five enemy planes – MIGs. He knows he’s running against time because he isn’t a young pilot anymore. One thing he was sure of: this was the end of him. He had known it before he came. He was thirty-one, not too old certainly; but it would not be long. His eyes weren’t good enough anymore. With a athlete, the legs failed first. With a fighter pilot, it was the eyes. The hand was still steady and judgement good long after man lost the ability to pick out aircraft at the extreme ranges. Other things could help to make up for it, and other eyes could help him look, but in the end it was too much of a handicap. He had reached the point, too, where a sense of lost time weighed on him. There was a constant counting of tomorrows he had once been so prodigal with. And he found himself thinking too much of unfortunate things. He was frequently conscious of not wanting to die. That was not the same as wanting to live. It was a black disease, a fixation that could ultimately corrode the soul. Cleve and every other pilot lives for nothing else but the adrenaline rush of a mission that may bring the possibility to shoot down an MIG and to survive another dangerous mission. The pilots are all competitive but that doesn’t mean they would endanger each other. They had shot down at least five MIGs apiece. Bengert had seven, but five was the number that separated men from greatness. Cleve had come to see, as had everyone, ho rigid was that casting. There were no other values. It was like money: it did not matter how it had been acquired, but only that it had. That was the final judgement. MIGs were everything. If you had MIGs you were standard of excellence. The sun shone upon you. Then, one day, Pell arrives. Pell is by far the most competitive pilot Cleve has ever met. And the most reckless. He’s assigned to Cleve’s flight, a small group of pilots of which Cleve’s the leader. Cleve hates him immediately. Not only because he’s so competitive but because he senses he would do anything for a kill and that he’s dishonest. Pell hates Cleve just as much. He’s jealous of his reputation and undermines his authority from the start. At first, Cleve’s very sure of himself because he’s known to be one of the best pilots but after he returns from many missions, without one single kill, he loses confidence. On top of that, Pell shoots down one enemy plane after the other and, so, killing turns into an obsession for Cleve. Cleve’s not the only pilot who seems to have forgotten, that ultimately they are in a war. The following quote might explain why this is the case. They talked for a while longer, mostly about the enemy, what surprisingly good ships they flew and what a lousy war it was. The major repeated that despairingly several times. The Korean war is often referred to as the “forgotten war” and this sense of not really knowing what they were fighting for, seems to have been almost universal. Many of the pilots who fought in the Korean war, fought during WWII. While they had the sense of having done good in Europe and the Pacific, they often didn’t really understand why they fought in Korea. However, the book doesn’t explore the political or historical dimensions of the war. It only focuses on the drama of the pilots. He was tired. Somehow, he had the feeling of Christmas away from home, stranded in a cheap hotel, while the snow fell silently through the night, making the streets wet and the railroad tracks gleam. The book offers a fascinating character study, or rather the study of two characters. And it’s suspenseful. We wonder constantly whether Cleve will make it, become an ace and leave Pell behind or whether Pell will leave him behind for good. And then there’s the almost mythical figure of “Casey Jones”, a Korean Fighter pilot who is so reckless and successful that everybody speaks about him and thinks he’s invincible. Shooting down a pilot like that, would make up for everything else. I can’t say more as it would spoil this excellent novel. It’s amazingly well written and surprisingly suspenseful. And, as if that was not enough, the end is unexpected and satisfying. The book comes with a foreword, for which I was glad as it’s key to understand in what formations the pilots flew and to know what the characteristics of the respective planes were. There’s a great scene towards the end, in which Cleve and another pilot fight with almost empty tanks. The logic of this and other fights would have been difficult to understand without the introduction. The Hunters is the third book in the Literature and War Readalong 2016. The next book is the US novel Billy Lynn’s Long Halftime Walk by Ben Fountain. Discussion starts on Friday 30 September, 2016. Further information on the Literature and War Readalong 2016, including the book blurbs can be found here.